Everything you ever wanted to know about GDPR but were afraid to ask. New data protection rules are coming into force in May 2018 under GDPR, the General Data Protection Regulation. There are some major changes on the way all businesses and other organisations hold their data but many leaders have no idea yet on what is involved. Insider's Cyber Security Breakfast on 24 August will focus on GDPR and what it means for your organisation. The keynote speaker is Scott Simpson, founder of The Security Circle, a cyber security and data security business working with businesses from SMEs to global organisations. Scott Simpson will outline the real practical implications of the new rules and what your organisation needs to do not to fall foul of them. The event will also feature a panel of other experts who, along with Scott will answer your questions on GDPR, data protection and cyber security. Participants will also be provided with a handout to take away on the practical steps that you need to look at taking to comply with the new regulation. Scott Simpson is a Certified GDPR Consultant & Cyber Security Consultant. 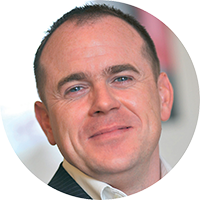 He founded The Security Circle in 2015 to deliver expert cyber security consultancy, GDPR and compliance services to clients worldwide and the business now has offices in Glasgow, London, Zurich, Dublin and Bermuda. With a team of over 20 GDPR consultants in the UK, The Security Circle offers bespoke GDPR compliance, data protection, cyber consultancy services and ISO 27001 certification to a wide range of clients, from SMEs to global blue chip organisations. Scott advises organisations on all aspects of GDPR compliance, data protection and cyber resilience. He is a member of the Biometric Institute and is Head of Government & Identity Security for Bowater Holographics, working with security agencies, military and defence organisations worldwide.